Rep. Nancy Pelosi said Thursday that Congress "must take whatever time it takes" to pass a health care bill. Washington (CNN) -- Senate Majority Leader Harry Reid said Thursday that Congress would pass a health care bill this year, while his counterpart in the House -- Speaker Nancy Pelosi -- outlined a two-step plan intended to maintain public focus on the issue. "We're going to do health care reform this year," Reid told reporters, the day after President Obama urged Congress in his State of the Union address to act on what was his top domestic priority in 2009. "The question is, at this stage, procedurally, how do we get where we need to go?" Democratic hopes to get a bill to Obama's desk by now were derailed by the GOP's upset win in last week's special election to fill Ted Kennedy's Massachusetts Senate seat. Pelosi, a California Democrat, said Thursday that Congress "must take whatever time it takes" to pass a bill. She described a two-step process in which the House would likely vote in coming weeks on a series of specific health care provisions that have popular support. 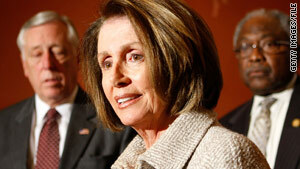 At the same time, Pelosi said, work would continue on finding a way to pass a more comprehensive overhaul later. Pelosi said the idea was to demonstrate continued momentum for some of the most important aspects of health care reform. A senior Democratic aide told CNN that leaders were considering votes on a series of bills before Congress is scheduled to take a week-long recess in mid-February. One of the bills could include a measure to repeal the antitrust exemption for insurance companies, a provision included in the House health care bill but left out of the Senate version. As reported Wednesday by CNN, House Democrats believe that moving forward with some health care reforms that the public favors would demonstrate their resolve to work on a top priority issue during an election year. However, several Democratic aides acknowledge it was unclear if the Senate also would pass the piecemeal health care measures. At the same time, House Democratic leaders continue to negotiate several changes to the Senate's health care bill in order to get enough support to pass it in the House. "We're not talking about minor tweaks," Pelosi said. The White House has negotiated with labor leaders to modify the tax plan for expensive health policies by exempting many health plans covering union workers until 2017. Pelosi indicated that some key insurance reforms, such as banning discrimination by insurers against people with pre-existing medical conditions, must be coupled with other major reform provisions. "Otherwise, you have no leverage with the insurance companies" and they would likely increase rates, Pelosi said. Republicans continued to criticize Democrats for moving forward with a plan they say the American people have rejected in recent elections. House Minority Leader John Boehner, R-Ohio, said his party has a better solution to the proposal that Obama and Democratic leaders "are trying to shove down the throats of the American people." In the Senate, some liberal Democrats have urged Reid to use a legislative tool known as reconciliation, which would allow some components of the health care bill to pass with only 51 votes. In the State of the Union speech, Obama acknowledged the health care issue has sown political division. "This is a complex issue, and the longer it was debated, the more skeptical people became," Obama said. "I take my share of the blame for not explaining it more clearly to the American people. And I know that with all the lobbying and horse-trading, this process left most Americans wondering what's in it for them." On Thursday, Reid, D-Nevada, linked health care reform to helping the U.S. economy recover fully from the recession. "Health care reform is truly economic reform," he said. CNN's Dana Bash, Deirdre Walsh and Tom Cohen contributed to this report.